Three miles into my run I came to my turnaround point. 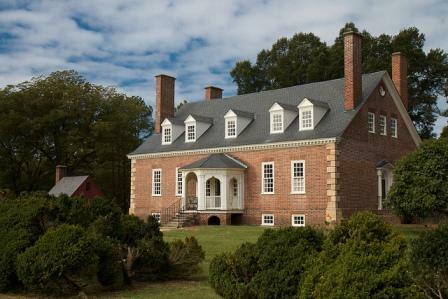 The Georgian Architecture of Gunston Hall was not of great interest to a 16-year old boy. My preference was for the woodland trails of the estate, but having jogged around the house and through the gardens enough times over many months, the simplicity of the house had imprinted itself in my mind. I lived in a neighborhood that had once been part of that great estate. When people visited we took them to Gunston Hall, because we had a connection to it, and because we knew they would never go there on their own. I remember my disappointment when I first visited. My idea of a plantation had been set by Gone With the Wind and Tara. 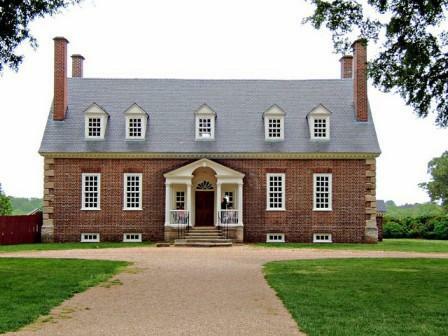 By comparison, Gunston Hall was just a plain brick house, and not any larger than our neighbor’s houses. I recognize now an elegance I could not understand then. There was simplicity, but it was intentional. There was a limited adornment on the exterior, but it was well done. When I see a Georgian house these days, I think back to Gunston Hall. It has become my reference point. I understand Georgian because I first understood Gunston Hall. Two views of Gunston Hall. The top is from the garden. The bottom is from the front. The porch on the front was a later addition. Georgian architecture covers a lot of ground and it means something a little different in America than it does in Britain. Georgian is a general term for anything arising or popular during the reign of kings George I to George IV. In architecture there were several styles prevalent in this period, including Classical and Gothic. In America the Georgian architecture applies exclusively to the architecture in a classical mode. English Baroque had been the prevailing style in Britain for palaces and large, public buildings. This was classically detailed but ornate in form, often with multiple levels of buildings stacked. Think of St. Paul’s Cathedral in London, with a two-story Greek temple flanked by what appears to be classical imitations of Gothic spires, all set in front of a massive Roman dome atop another two-story version of a Greek temple. Georgian architecture returned to a cleaner, purer classicism. For houses in the colonies this generally meant a simply adorned rectangular house made of wood or brick. In America the Georgian Architecture was not a reaction to anything. Colonists were simply applying the culture they admired and felt apart of to their local situation. It was the upper classes showing that they were as good as their peers in England and could take a step up from the vernacular housing that prevailed in the colonies. 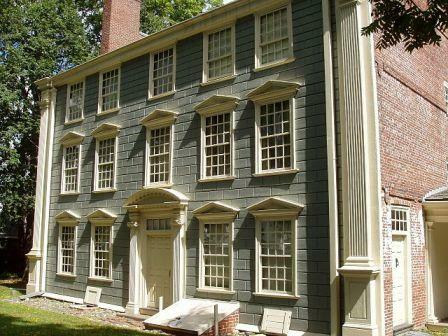 Colonial houses were often symmetrical and rectangular, but often as not, wings or projections would be added without regard to maintaining any symmetry. Roofs were often of the saltbox variety, longer on one side than another. The addition on the side might just have a shed roof. In contrast, Georgian architecture applied discipline. Additions were fine if they are applied symmetrically and with a view to maintaining correct proportions and balance. Windows were not added higgledy-piggledy. They were added based on the view from outside, rather than the view from inside. Roofs might be gabled, hipped or gambrelled, but symmetrically so. Georgian roofs were generally not too steep, nor all that different the houses in the surrounding area. They would get flatter when Georgian was replaced with its cousin the Federal style. Roofs had a minimal overhang relative to the walls. Chimneys tended to be paired with one or two on each end wall. Where a house was brick or stone, quoins were generally used on the corners. This feature would disappear with the Federal style. Houses were usually built with five bays or seven. The odd number allowed the doorway to be centered and in line with a second floor window. Typically windows were evenly spaced, but it was also common, like with Gunston Hall, where the spacing around the center window was a little wider, to provide room for a wide door without crowding the first floor windows. Windows were always set individually, not grouped or paired. Dormers on the top floor were usually gabled and smaller than the windows set into the walls. Georgian houses tended to lack shutters, but I have seen plenty with shutters. These may simply have been revival houses built later and lacking historical accuracy, or they could have been added on later. Doorways were a minor centerpiece of display. Sometimes there was a set of square lights (or windows) over the door. There was usually a pediment over the door, and sometimes a covered entryway, but usually not the massive Greek portico common on Palladian houses. Covered entryways were much more common with Federal houses. The pediment over the door was usually supported by pilasters flanking the door. Pediments over windows were not uncommon, but often absent. It was common for there to be a partially sunken basement, with rooms for servants or household functions. The first floor would have the public rooms. The second floor would house the bedrooms. All would be symmetrical about the center hall. The insides of a Georgian home could be flashier than the outside. While the tendency in America was towards the "neat and plain", houses of the elites often mimicked the taste for the ornate common within the British upper class. Wood paneling was common in Georgian homes of the wealthy, though it was often painted or papered. 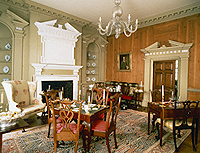 The public rooms in Gunston Hall have elaborate fireplace mantels. Flanking the mantel and set into the wall are two beaufats, or niches, used to display china or other costly items. The rooms are adorned with graceful, flowing rococo wood carvings. For those not able to afford such finery, Georgian house interiors could be plain. Later Federal houses sometime simplified the interior décor, but Georgian homes for the less-than wealthy often lacked the resources to indulge in extravagance and thus had no excesses to for which to repent. You will find fewer original Georgian homes than Federalist homes simply because it is an older style and fewer survive, and because the population was smaller at that time. There were also houses updated from Georgian to Federalist, but fewer that took the step backward from Federalist to Georgian. Below, I have attached a couple of photos of a Georgian house from Massachusetts. The Isaac Royall house is an example of the difficulties in classifying a house. It is definitely Georgian, but it has some unusual features and an unusual past. It started out as a two-story and was one-room deep. It was expanded to three stories and two rooms deep, and the facades were laid over brick. On the front you have clapboard running between the quoins, and spandrel panels between the windows of each floor. On the back side you have a pseudo-stone front running between two Doric pilasters. The large, joined chimneys were added during the expansion. The spandrel panels and the Doric Pilasters are all a little unusual, though not totally unique. You can find them elsewhere, but they are not common enough to use as a classifier for Georgian architecture. 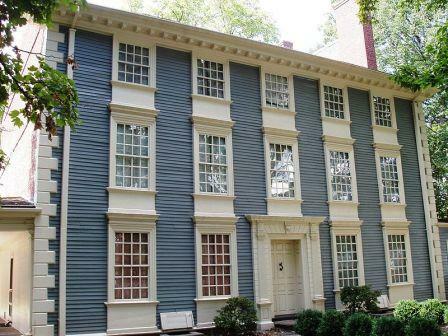 If you enjoyed this article, you may also be interested in my other articles on house styles, where I talk about Cape Cod, Federalist, Greek Revival, Carpenter Gothic, Italianate, Stick, Queen Anne, Second Empire, Tudor and Craftsman style homes.